The 2016 Momentum Giving Project focusing on Housing Justice raised $127,662 to help fund organizations addressing root causes of displacement, renter exploitation, gentrification, and much more in the region. This amount included a public screening of My Brooklyn in conjunction with Northwest Film Forum, which raised over $11,000 in a single night. 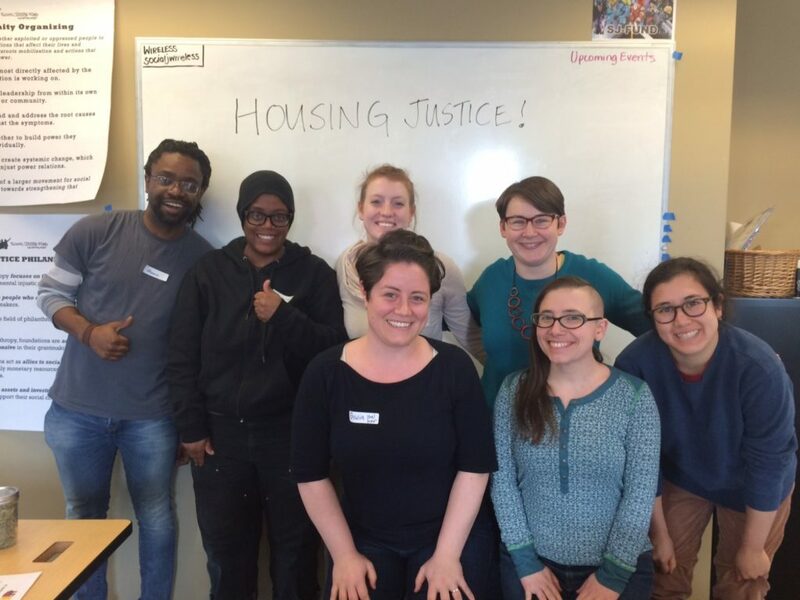 Housing Justice Giving Project members Mano da Silva, Dean Jackson, Amanda Brown, Esther Handy, Giulia Pasciuto, Maia Williams, and Margaret Weihs. Not pictured: Ubax Gardheere. Organizations marked with a * after their name have hit SJF’s annual funding cap with this grant, meaning that they have received $30,000 in funding from Giving Projects in a single year. Hitting the funding cap means that their work has been funded across multiple Giving Projects and areas of focus. Community Alliance of Tenants (Portland, OR) Our mission is to educate and empower tenants to demand and obtain safe, stable and affordable rental housing in Oregon. CAT addresses the impact of Oregon’s decreasing supply of safe, affordable housing and absence of meaningful protections for tenants from unjust evictions and unsafe housing conditions. Our proposal will win more protections for tenants living in substandard rental housing, and against no-cause evictions, rent increases, and other forms of displacement. Got Green* (Seattle, WA) To ensure that low income communities and communities of color in Seattle and South King County gain equal access to and reap the benefits of the green movement and green economy: green jobs, healthy food, energy efficient and healthy homes, and quality public transportation. Our Climate Justice Committee is in the early stages of developing a grassroots campaign at the intersection of housing justice and climate justice. Hilltop Urban Gardens (Tacoma, WA) Hilltop Urban Garden’s mission is to develop systems for food sovereignty and create racial and economic justice. This funding will help us build community knowledge about development and gentrification. Our learnings will guide future campaigns to address gentrification and preserve the affordability of housing in our neighborhood. Missoula Interfaith Collaborative (Missoula, MT) Empowering people directly affected by homelessness and incarceration to organize and engage in advocacy, interrupting the cycle of homelessness and incarceration. We are seeking funding to expand our leadership team, provide trainings on effective communication, organizing, and advocacy skills, and provide for general expenses such as travel to legislative sessions, printing, and advocate stipends. OPAL Environmental Justice Oregon* (Portland, OR) OPAL advocates for a just transportation system, inclusive housing and investment without displacement, health equity, and empowered, engaged communities who enjoy equal access to opportunity. SJF’s support will continue our successful history of winning relief for low-income people and people of color. Membership is currently focused on bringing better transportation and other resources to our neighborhoods, while our advocacy works in multiple coalitions to ensure economic development doesn’t displace the low-income people and people of color from newly-revitalized neighborhoods to areas of our city. Puentes (Seattle, WA) Puentes mobilizes mental health resources to help undocumented migrants and their families cope and flourish despite our broken immigration system. With support from SJF, Puentes will lead a grassroots organizing efforts of undocumented immigrant mothers in South Park intending to target the root causes of housing instability and gentrification. 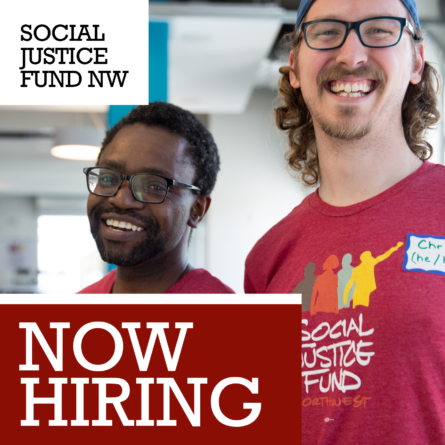 By investing in this group, Social Justice Fund is contributing to a radical model of organizing leadership – one truly led by those directly affected by the issues and supported by external partners. Puget Sound Sage (Seattle, WA) Puget Sound Sage improves the lives of working class and low-income families by building power for economic justice. We work to create racial and social equity, a stronger democracy, better jobs, a clean environment, and thriving communities. Funds will go to support Sage’s equitable development programs, anti-displacement and affordable housing agenda. Right2Survive (Portland, OR) Right2Survive is Houseless and formerly houseless individuals and supporters dedicated to teaching and defending the Human, Civil and Constitutional rights of people experiencing homelessness. We will use the funds to educate un-housed individuals on how to run low barrier shelters, and to strengthen relationships with our ally organizations. Tenants Union of Washington State (Seattle/Spokane, WA) The mission of the Tenants Union (TU) is to create housing justice through empowerment-based education, outreach, leadership development, organizing, and advocacy. As a membership organization, the TU’s work is grounded in the strong conviction that tenants must be the leaders of efforts to transform our housing conditions and communities. Funding from the Social Justice Fund will be used to support our organizing campaign which endeavors to end the skyrocketing rent increases and rampant displacement occurring throughout the state. Wind River Native Advocacy Center* (Riverton, WY) The vision is a community engaged in self-determination for education, health, economic development and equality for the Wind River Reservation. The mission is to empower Native Americans in Wyoming through community organizing, education, mentoring, creating allies, research, legal advocacy and leadership development. Tribal members on the Wind River Reservation (WRR) have a severe housing shortage. Tribal housing programs lack adequate resources to meet the needs of reservation residents. There is a need for education and assistance for people seeking help in solving the housing crisis. Adequate housing should be a fundamental right to life, and the Wind River Native Advocacy Center (WRNAC) will continue to address the housing problem for Shoshone and Arapaho community members.